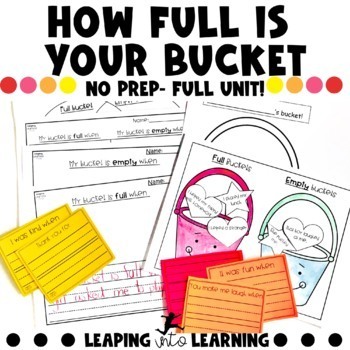 The activities that I’ve created are based on the book “How Full is your bucket?” written by, Tom Wrath and Mary Wreckmayer. There are a few elements to this unit. Compliment/feel good cards- Spread the kindness! Sentence starters for students to help them get started writing nice notes to each other! Blank pages with a picture box and lines. The lines are either bigger or smaller, allowing for more or less writing. Lastly, I’ve added a picture of a bucket so students can chose to either write or color inside. * Teaching tip: Sometimes I allow my students to draw a picture before their writing. When students are writing about abstract concepts, they may need a little extra help putting words to their thoughts. Drawing a picture beforehand helps bring their thoughts to life!